“The systematic and knowledgeable research of the socialization processes in the perspective of dynamic course of contemporary post-modern, sedentary and consumerist society is in various perspective permeated, though, calls essential traditional family roles into question. But the family is the primary face-to face field where the processes of socialization are started, enhanced or hindered and just the family is the place offering various outside external interactions contributing to the complexity of personal structure of values and an abundance of life experience. Family would either enhance or hinder the broad spectrum of socialization and cultural experience: peers, friends, teachers, clergymen, other groups, trainers, etc. The fundamental objective of such complexity of family internal and external socialization is experience of love, trust, competence, autonomy and general sense of well- being. Proper understanding of mutual relations of the person and the environment offers Self Determination Theory (SDT). This theory is rooted in though that personal well-being in this context is satisfied first and foremost if three basic psychological needs: relatedness, competence and autonomy. Broadly astride attitude to manifold aspects of SDT is characteristic in collective monography “Self-Determination Theory: A Family Perspective” published in prestigious American publishing house NOVA publishers, New York. The quality of the book is predetermined by the names of book editors: Nicolette Vanessa Roman & Eugene Lee Davies, both globally well-known South African specialists in the field of parenting styles. Editors collected contributions of almost twenty authors from South Africa, Belgium, Nigeria and Portugal; most contribution are originated in Western Cape University, Cape Town, South Africa. 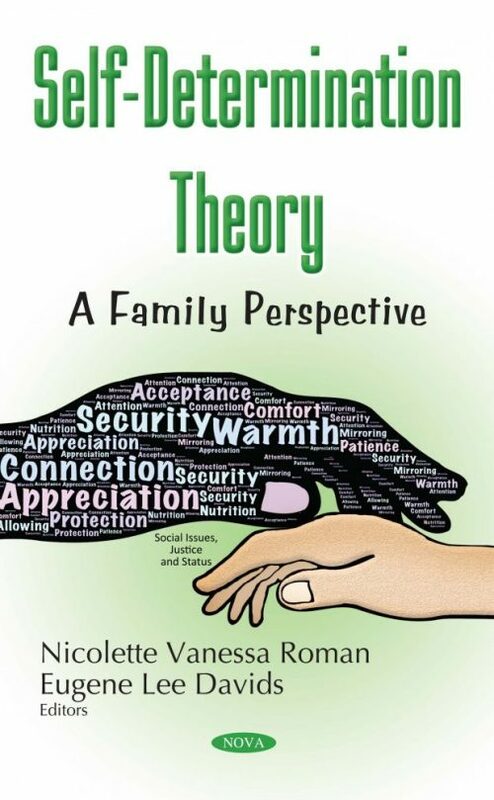 Common denominator of the book is the family as an agent of developing the sense of well-being. Eleven chapters then contributed to our better understanding of the colorful aspects or features of mutual relations of self-determination and the family. scientific references, is very inspiring in the field of the nature and impacts of family socialization as well as in the context of styles of family education. “A Self Determination Theory Perspective of the Role of Family Structure” (Jose M.Frantz & Zeenat Yassin) is analyzed particularly in the context of one and two parents’ families in the perspective of child development and well-being. It is concluded that family as a main primary societal group plays a significant role in the satisfaction of the basic psychological needs, which leads to increased internal motivation directed towards self-integration and growth, resulting in the well-being and optimal functioning of the adolescents. It is accented that children that experience parental separation are, on average, worse on average than their peers’ intact families. And, it is understandable, that it is of growing importance to prepare children for to deal to various life challenges that the life in contemporary complicated postmodern society brings. “SDT and Family Conflict: A Theoretical Overview” (Zainab Kader & Vanessa Roman) as the topic of the third chapter is based on assumption that family conflict has emotional and behavioral contributions which affects basic psychological needs. In the perspective of SDT the family conflict, as the active opposition between family members, implies an impact on the satisfaction or frustration of basic psychological needs and consequent experience amotivation as the environments unsettle and does not support need satisfaction of family members. And families would prevent conflict and resilient their cohesiveness doing activities such as eating together, playing together and spending quality time together without technology (p. 59): But unfortunately not easy feasible suggestion in the context of contemporary sedentary consumerist society and fast-moving times! The chapter “SDT, Family and Political Socialization of the Youth: A Theoretical Overview” (Michelle V. Esau) observes abruptly waning political interest of the (South African) youth as the tendency threatening the quality of democracy in the future. Generally, the family can socialize youth to politics in two ways, namely, through political discussions and the active engagement of family members in political activities. Searching by means of ample scholarly researches is concluded existence of dissonant opinions about what bears greater influence. The research in general shows that youth who discuss politics more frequently with their parents are more interested in national news, display higher level of political knowledge, public communication skill and community service. Family is identified as central to developing a sense of civic engagement in the formative years. In this context it also accented that internalized forms of extrinsic motivation can contribute to the well-being and development of the individual. Next chapter “Using Self-Determination Theory to Explore Notions of Competence, Autonomy and Relatedness within the Context of Adverse Childhood Experiences of Social Work Students“ (Glynnis Z. Dykes) emerged from qualitative case study exploring positive family experiences as well as negative ones. Former were mostly rooted in harmonic family relationships; shared activities and togetherness; living with extended family; meeting basic needs and positive religious lifestyle and school success. Later – negative experiences reflected emotional abuse, physical neglect, sexual abuse, ineffectual care-giving; pure role fulfilment of care-givers; unstable and poor family and marital relationships. Most noticeable impact of negative family relations are reflected in low self-esteem; enduring negative consequences; emotional aftermath; physical effects. It is concluded that the honeymoon of family circumstances in strongly related to positive elements of intrinsic motivation in the field of competence and autonomy. Contribution from Nigeria (Oluyinka Ojedokun) “SDT and Self-Regulation of Academic Attainment within Typical African Family Settings” broadly reviewed studies indicating that intrinsic motivation and fully internalized extrinsic motivation are related to positive educational outcomes. But yet the most African children are more likely to discourage from learning and may not reach their full, academic potential. Most parents in polygamous families might be illiterate and incapable for to motivate their children towards pursuing higher education. This is in many respects to the polygamy nature of many African families, poverty, and fact of unenthusiastic parental encouragement that may limit the amount of physical attention and time available for active individuals. As the consequence, individuals, from such family settings have limited chances of being externally motivated to pursue higher educational goals. For typical African (Nigerian) society only in specific occurrence the nature of interaction within the family seems to facilitate positively internalization of self-regulation of academic attainment. Collectivistic nature of most African families is not in most cases supportive milieu or a supportive agent for integrated academic goals. Specific theme is in the centre of research attention in the paper “Autism Spectrum Disorder and SDT: The Importance of Family Involvement” (Bronwyn Mthimunye, Athena Pedro & Nicolette Vanessa Roman). It is accented that the needs of an autistic child in complexity absorb need for love, stability, good relationships, and the opportunity to achieve goals and fit into society without being judged and labelled. Besides autistic child may present other disabilities such as Attention Deficit Hyperactivity Disorder or Fetal Alcohol Spectrum Disorder. Such children becomes dependent on the health services and in other areas as schooling cannot meet the goals set out for achievement and performance. The role and importance of family life routines is on that account of great importance: Parenting routines, child routines, literacy activities, physical and play activities and outside activities. It also means to allow the family to participate in integrated leisure, recreational, and social activities. For the autistic child the stability of the family and family support until the child choses to live independently is essential and not substitutable. Parenting domain is discussed in the contribution “Psychologically Controlling Parenting: The Effect of Internal and External Environments” (Anja R. Human-Hendricks & Nicolette Vanessa Roman). The comprehensive review of relevant scholar literature in this field concludes two parenting styles that have been adopted by parents: warmth and control. Parental control is described as a cluster of behaviours through which parents extensively control and regulate their children´s activities and routines, encourage children´s dependence on their parents and instruct the children on how to think and feel. High psychologically controlling practices create a restrictive environment for individuals to develop optimally into independent decision making individuals. Parental psychological control is associated mainly with depression and antisocial behaviour whereas such parenting style is associated with lower anti-social behaviours. Warmth supportive parents and the family on the other side provide the implementation of intrinsic motivation of individuals to achieve proper goals and aspirations. The contribution in context of very systematic study of manifold aspects of Self-Determined Theory and parenting styles suggests that for versatile, active and educated individuals is essential to assume the roles, responsibilities, values, life lessons, self-identity and relatedness to their external environment. The study also appreciated parenting supportive practices as positive agent of optimal relation within an environment. BMI Scores of Children in Low and High Socio Economic Status“ (Khalida Sabi, Melissa Brown & Nicolette Vanessa Roman) as the next scholar text of this monography examines obesity in the perspective of fundamental socio economic status of the family. In such context familial environment in which parenting takes place is discussed with relevant factors associated with overweight and obesity children: Unsuitable eating habits and physical inactivity above all. In fact, it reflects the general problem of an excess of energy intake in relation to energy output. The study reminds us that an excess of energy intake due to the reflection of the child´s environment reflects also the fact that poor communities are not in position of proper option to consume healthy foodstuff; from economic reasons (and) or ignoring recommendation for proper and healthy eating habits. Parenting styles (authoritarian, authoritative, permissive) and socio-economic status are discussed in the context of BMI scores of children. It is evident that within the high and low socio economic areas there are many challenges that exists in this context. High socio cultural environment produces the stress of maintaining good health care and education, low socio-economic area reflects poor health care and lack of nutritionally sustained food. Socioeconomic status is comprehended as not prevalent but strong agent in parenting styles as well as nutritional status of the child. Three authors from University of the Western Cape (Karin Elizabeth Daniels, Eugene Lee Davids & Nicolette Vanesse Roman) discussed basic psychological needs of children within from the perspectives of parents in the chapter “SDT: Perceptions of Parents Regarding the Psychological Health of Their Children in Early Childhood Development“. It is accented that children from birth to nine years need parents support to physically, mentally, emotionally, and socially to grow and to thrive. Parents as the primary caregivers, serve as an important component to provide children with a loving, warm a nurturing environment. The study of this theme employed a descriptive, cross-sectional research design, where parents reported on their children´s psychological functioning within the familiar home and school environment. The findings indicate at all very positive approach of parents in the field of mutual relations of family and school; authors for the future research recommend to search also the question whether differences exist between the perceived experiences of environments that both satisfy and frustrate basic psychological needs. Last contribution in chapter eleven “Parenting, Cognition and Motivation in Career Decision-Making Processes: A Self-Determination Theory Perspective“ was prepared thanks to international research cooperation of Pedro Cordeiro, Paula Paixao &Victor Ortuno (Portugal) and Marlies Lacante (Belgium). It describes mobilizing of multiple psychological processes during a decision of Portuguese 12th grade secondary students about their intention to proceed for higher education or to enter the job market. Students were assessed across several constructs, including perceived parenting, psychological needs, career decision-making and phenomenon of psychological well-being. Findings suggest that experiences of parental need-support were associated to the adolescents´ feelings of higher need satisfaction and increased self-confidence in career decision-making; the active parental need-thwarting experiences reflect the adolescents´ feelings of psychological need frustration. It is concluded that these associations seem to indicate the existence of substantively distinct pathways of career identity development and adjustment. It is also recommended the need to design more contextualized psychoeducational interventions that are able to differentiate the students needing more intensive career counselling to support their knowledgeable self-determination and volitional functioning.